St. Paul artist Chris Larson engages his imagination in a number of different artistic disciplines, including sculpture, photography, drawing and filmmaking. What results is art that often makes a grim statement about human existence, but is also attention-grabbing for its sheer size or ornate detail. Larson's multi-faceted talents are on display in a new show which occupies three galleries at Franklin Art Works in Minneapolis. Minneapolis, Minn. — Chris Larson admits he draws power from creating fantastical worlds that resemble reality but have no clear function. As a sculptor with impressive carpentry skills, he's often concentrated on making incredibly elaborate, archaic-looking wooden machines from some bygone era. He does it in part to see where his imagination will take him, but also because of the way it engages the viewer. "You wouldn't look at it and say, 'Oh, that's art,'" he says. "You'd look at it and you'd say, 'Where did this thing get drug out from?' You'd start asking different sets of questions ... like, how does it work? And I don't think you usually ask a piece of artwork how it works. You usually ask, you know, what the hell does it mean?" The centerpiece of the exhibition sits in the main gallery, occupying nearly half the space. It's a giant pine wood sculpture of a comic book-style spaceship crashing into a wooden shed, captured at the moment of impact. At first, it's impossible not to be taken in by the drama of the scene, the way the walls of the shed are being shattered apart and the debris is gathering beneath. Upon further viewing, the metaphoric possibilities of the piece start to surface. Larson isn't quite sure where it came from. "There was a lot of things going through my head this past year," he says. "And invasion is probably a big part that's been on a lot of people's minds." "I wouldn't go and say this is about this church that was blown up in the '30s. I wouldn't say this is about like invading Iraq or some planes crashing into buildings," says Larson. "It's just -- there's a lot of two worlds colliding right now, and it doesn't seem like they're colliding real well." Star Tribune art critic Mary Abbe has seen Larson's work before in other settings, and often came away with a mixed reaction. 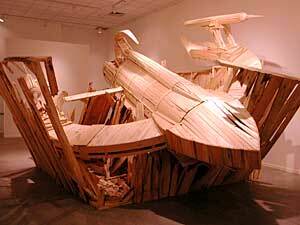 The massive untitled sculpture of the crashing wooden spaceship convinced her he was finding his voice. "In the past I've often felt that Chris's stuff had a kind of brooding potential about it, but I wasn't quite sure where it was going," Abbe says. "When I walked in and saw the new piece at Franklin, I felt as though he had encapsuled, in one structure, all of the previous stuff." There's a lot of two worlds colliding right now, and it doesn't seem like they're colliding real well. For Larson, the piece was liberating. Finally, he could describe what he was creating in literal terms. A spaceship crashing into a Ted Kaczynski shack. He can't say the same thing about "County Line," a nine-minute film that's also featured at his Franklin show. "I don't know how the hell I'd talk to you about my film," he says. "There's no simple way to talk to you about the film because it seems otherworldly or underworldly." Larson's film is set to an eerie soundtrack. The camera settles on this dark, forbidding cage-like wooden machine. The capsule-shaped contraption consists of enormous gears, cranks, clamps and rods, and generates a gooey oily substance that runs through a trough around its perimeter. There's room for two men, one perched above, the other below. They power the machine with small movements. One moves his head from side to side while the other grasps a lever in his mouth. It's obvious the machine has no apparent function, and the enormous effort being put forth by the two sweat-drenched laborers is a futile exercise. Is it a statement about the drudgery of everyday life? Possibly. Or maybe something more sinister. "I didn't realize how dark it was until opening night," Larson says. "Some people would go in and come right back out and say, 'I'm not walking out because I don't like it, I just, I can't deal with this tonight cause it's so, you know, it's pretty thick and heavy.'" The Star Tribune's Mary Abbe says Larson hasn't created any kind of new aesthetic to communicate his dark, absurdist themes. "But I certainly think he has a distinctive voice," Abbe says. "And there is something about that hard-working carpenter quality that does make him seem very Minnesotan. And I certainly like the philosophical overlay that goes along with the hard-working carpenter." Chris Larson is busy. His third solo show in New York is in November. He's displaying his work right now at a gallery in Winnipeg, and will mount an exhibition in Berlin later this summer. His show at Franklin Art Works, "Chris Larson: Sculpture, Film, Prints," runs through June 5.